Sometimes it pays to skip the fine print. When I requested this title on NetGalley, I did so because I recognized the name Jojo Moyes from Me Before You fame and thought it would be cool to be one of the first to read her latest book. It wasn't until after my request was approved that I discovered The Ship of Brides has actually been in print since 2005 outside the US. Because Moyes's recent work has been so successful here, this earlier novel is being released in paperback for US readers this month. Now that I've read it, though, I'm really glad a few details escaped me that day. The Ship of Brides does what my favorite historical novels do—it brings to light a particular event in history of which I've been woefully unaware. In this case, in 1946, hundreds of women, swiftly married during WWII to foreign sailors, were shipped halfway across the world on an aircraft carrier to be with their British husbands, leaving their entire lives behind. Not only had I never heard this story, I could hardly believe it was based in historical fact. The uncertainty, the cramped quarters, the loss of the familiar—how could anyone have done it? Through her four main characters, Moyes captures all the complex emotions of the women's time aboard the ship. Their journey from Australia to England took six weeks, plenty of time for tempers to flare, judgment to descend, and in one memorable scene, undergarments to be strewn about the liftwells. I loved getting to know all the characters, even snobby Avice, who proved that mean girls are far from a modern phenomenon. I couldn't wait to find out Frances's secret—why was she so standoffish, refusing to talk about her husband or her former life? Flighty, sixteen-year-old Jean was endearing despite her immaturity, and I related to sturdy, practical Margaret, who grew up on a farm surrounded by cows and brothers. 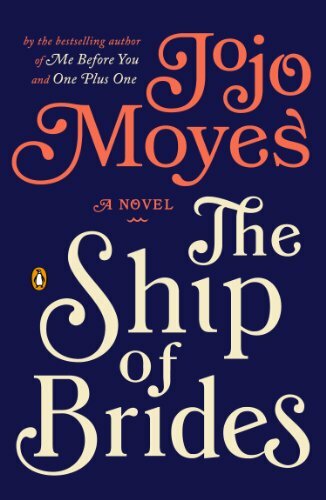 Moyes shows not only the diversity of the brides' personalities, but also the various circumstances that brought them on board and met them when they disembarked. A few brides were widowed before ever reaching port. Some received dreaded “Not Wanted Don't Come” telegrams from their husbands. A number of them were in the final stages of pregnancy and hadn't seen their husbands since their waistlines were pert and trim. None of them were sure what kind of life awaited them in England, but their wide-eyed hope was compelling. I'm glad I fell backasswards into reading The Ship of Brides. It's well researched, smoothly written, and satisfactorily romantic. I'm looking forward to reading more of Moyes's work in the future. With regards to NetGalley and Penguin for the advance copy. On sale (in the US!) October 28. Newer:Rooms by Lauren OliverOlder:LiterScary Challenge #1: Ready to Do Some Digging?